Tassels began popping up here a little, there a little and now they’re everywhere! Designers are putting them on bracelets, handbags, scarves, earrings. shoes, and necklaces. I’ve even spotted them in several other facets of designs, from interiors to party decors. And if you’re wondering why the rage? Well, it’s quite simple, tassels are a fun, easy, and versatile accessory and believe me, if you want to join this craze there will be a tassel version that will fit your bill. I joined the tassel craze first by adding this necklace to an already free spirited kind of outfit. It seemed to bring all the other items and elements right together. . .
From my floppy hat . . .
high heeled sandals . . .
I’m thinking this tassel craze is kind of fun. When I spotted these spotted these flats with the added tassels, I just couldn’t resist joining from the feet up. I’m so looking forward to pairing them with a pencil skirt and possibly some fun socks. So have you joined the tassels craze? 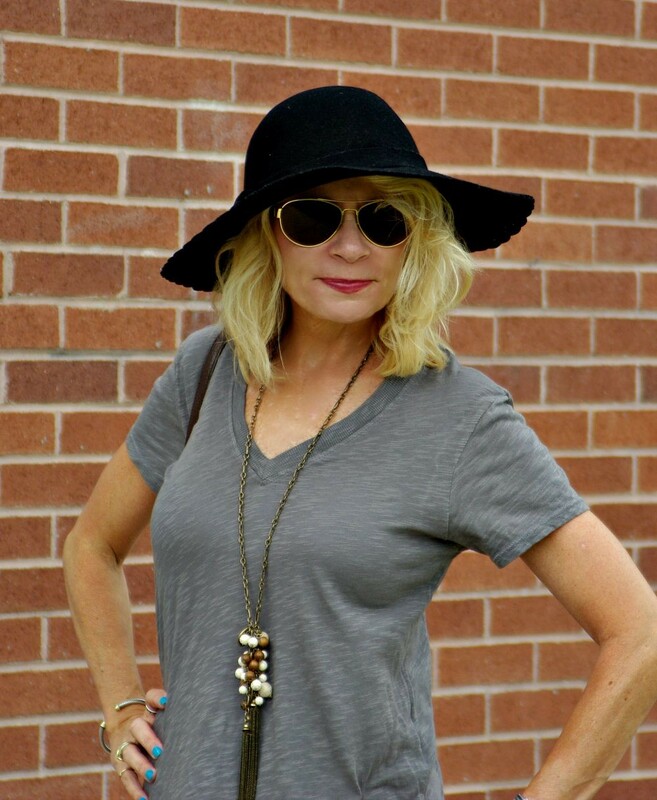 My two blogging friends Jill at (everythingjustso) and Adrienne at (therichlifeonabudget) chose tassels for this months HWIM series. 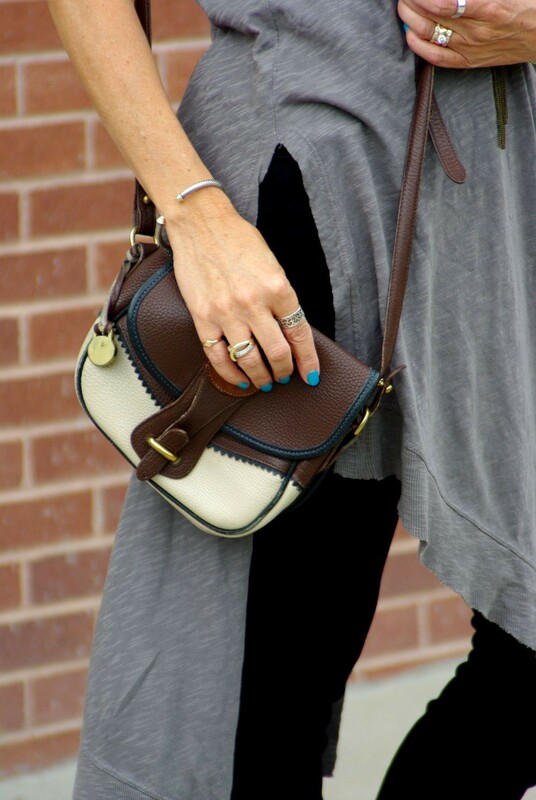 Head on over to their fun posts and check out all the great tassels. I really like the simplicity, balance and modernity of this look. The asymmetric shirt is beautiful. Thank you Josep-maria, I’m having lots of fun with this asymmetric shirt. I’m loving the tassel look. I have a meditatin Mala in my sights which is right on trend. You look great!! As always! Thank you Jennifer, this tassel craze and trend is quite enjoyable, isn’t it? Great outfit. Love the sandals. Tassels are cute. Once, during the Eighties, I wore expensive men’s shoes with tassels on them. Hey, it was the Eighties! I think a pair of shoes with tassel on them is something you need to put back on your feet. I’m going to be looking for them . . .
Oh you are looking so good. In both outfits. Never did I think the tassle shoes were Zara. I though they were really expensive. The little boots you are wearing are very similar to the ones I bought… and gave away as I couldn’t style them. Stupid me. Just couldn’t get used to such a new look in time. It always takes me ages to adapt (adopt??) Now that I see them on you, I think “rats”… Should have held on to them. I love tassles. Bought one from Suzanne and I have two oldies but goodies. As you say: it pays to hold on. Oh, you definitely should have held on to them. Were they as comfy as mine are? If so, then I’m truly sorry you let them go, you silly girl. I do believe I remember the one you bought from Suzanne, it’s wonderful. In fact, it was one of the items that really got me thinking I needed to jump on this bandwagon. Thank you for the compliments, my lovely friend. Hello from London – I just bought, albeit too late to add to the HIWM blog, a fantastic tassle clutch from Coccinelle. Fantastic colour and HUGE tassle, I am looking forward to taking it out (along with the husband) to dinner tomorrow night. So lovely to see a trend from the past come back with a new swagger. I’ll be checking out Zara shoes tomorrow on the High St. Looking forward to next post. Can’t wait to see your tassel clutch, please let me know when you post it. Really love that first look and the necklace! Thank you Suzanne, I really love the look you submitted as well. Your dress is so unusual! Love how its so asymmetrical! your coloured nail polish looks so effective against the neutral colours. You look great! I always adore everything you wear Trina and these outfits are no exception. 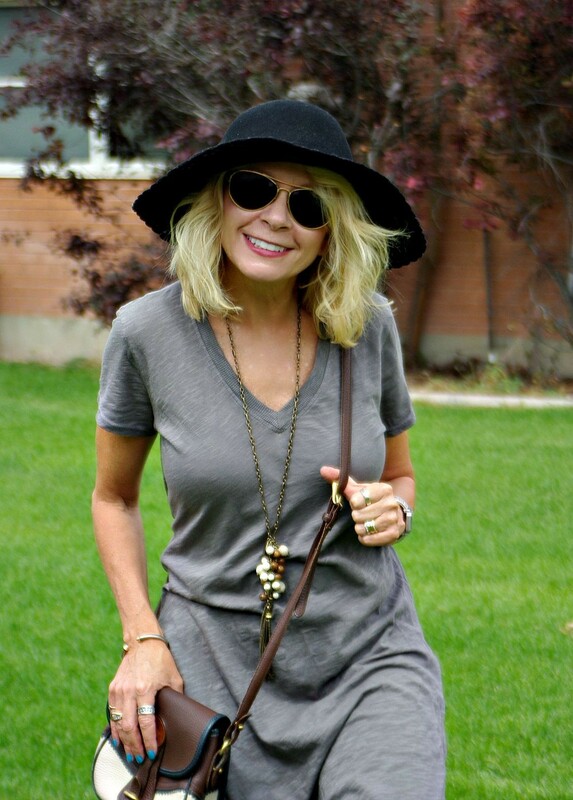 I love the gray tunic top which is so edgy! And absolutely love the colors and patterns in the second outfit! You THREE blondies look so cute…and relaxed and ready for a fabulous Fall. Tassel craze, well yes, guilty! Love your necklace, and low key outfit where all of the details are so rich and tummy ( bag, floppy hat). Also love the new shoes, the woven chevron + tassels are great!